Hate sin, not the sinner! This ideology is magnificently revealed under the distinguished leadership and guidance of His Holiness Shri Ashutosh Maharaj Ji. 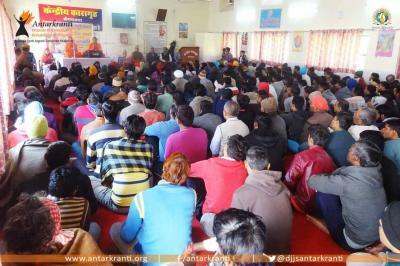 Antarkranti, an initiative of Divya Jyoti Jagrati Sansthan (DJJS), conducted 3 days awareness program at the District Jail Premises, Yamuna Nagar (Haryana) from Jan. 21 to Jan. 23, 2015. During the program, DJJS preachers Swami Vigyananand Ji, Swami Margdeepanad Ji and Swami Haricharnanand Ji gave an insightful speech to the inmates on plethora of topics like Yoga, Moral Values, Spirituality and Health Issues. It touched the cord of the inmates. The message was loud and clear: “Moral values are not only the subject of teaching but living!” 240 prisoners actively participated in the event and took pledge against drug addiction. 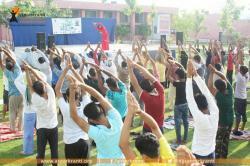 The session stressed on adopting yogic and healthy lifestyles. Various yogic postures were taught by Swami Vigyananand Ji which was then practiced by the prisoners which helps oneself living healthy both physically as well as spiritual. The session also provided a spiritual orientation to the prisoners for the need and means of awakening their self-consciousness. It forced them to introspect and impelled them to keep a watch on their actions. This was beautifully linked with the progress and development of the nation as a whole. 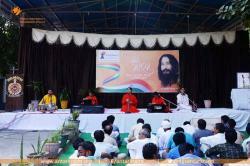 A clear path of self awakening to global peace was explained to the inmates. The guest DSP Sh. Jaswant Singh gave the valedictory remarks and appreciated Antarkranti project of DJJS for its selfless efforts. He also encouraged inmates to implement the values & spiritual thoughts delivered. The level of motivation was worth watching and inmate’s enthusiasm was highly positive. Overall the event was very successful in touching the right cord of the inmates and treads them on the path of transformation.